Three new free schools have been given the go-ahead to open in the borough, amid proposed cuts to local authority education funding. Hackney Wick Academy, Hackney New Primary School, and Halley House School (formerly known as Dalston Free Primary School) are set to open in September 2015.Hackney Wick Academy is a secondary school that will aim to accept 150 pupils from September 2015. In its first year, Hackney New Primary School, an expansion of the existing Hackney New School, a secondary free school, will take 50 reception students. Halley House School, founded by the Bellevue Place Education Trust, will provide 60 places. A total of thirty-eight new free schools across the UK were approved in the current wave of applications, one of three opportunities per year for members of the public to apply to open their own schools. Free schools and academies are independently-run and accountable directly to central government, rather than local councils. Hackney’s three new free schools will join six academies and two free schools already open in the borough – the Olive School, set to move into the disused Hackney Central Police Station; and the Hackney New School in De Beauvoir. There are also plans to expand Hackney’s flagship Mossbourne Academy with two new sites, one in Victoria Park and one next to Queen Elizabeth Olympic Park, on GLA-owned land allocated by London Mayor Boris Johnson last month. But the vast majority of the borough’s schools are still overseen by Hackney Council. As more free schools are approved and academies expand, proposed cuts to council education budgets may pose a threat to the funding of existing schools. If the proposed cuts go ahead, local authorities will lose 20 per cent of their Education Services Grant (ESG), this year worth £116 per pupil, which is distributed to councils to fund maintained school improvement, education welfare and other services. A similar grant for academies provides £140 per pupil. London Councils, which represents the capital’s local authorities, is continuing to lobby to protect local authority education budgets. Hackney Mayor Jules Pipe, chair of London Councils, said: “The capital’s schools are now the best performing in England and Wales. “Parents, Ofsted and the law all see a local government role in supporting rising education standards. In a YouGov poll commissioned by London Councils, 76 per cent of London parents want local authorities to have the power to influence all local schools, including academies. 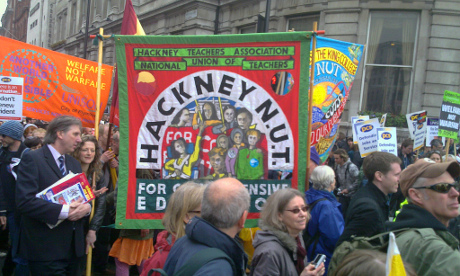 Jamie Duff of Hackney NUT said the expansion of free schools represents the “break-up of state education”. As academies and free schools are the only types of schools allowed to open, they are the only way to provide much-needed school places.